Animal drawing and painting takes a deep understanding of the skeletal and muscular structures under the fur or feathers. This book by Charles R. Knight not only covers major groups of mammals domestic and wild, but also some birds, reptiles, fish and invertebrates. I've used it as a reference since I got my first copy in high school and worn out three copies so far. Charles R. Knight, nature painter and muralist (1874-1953) created the backdrops for thousands of animal exhibits in various natural history museums. Nearly every Dinosaur Hall worth mentioning has one or several Knight murals. Though they are dated by modern paleontological discoveries, they still carry a strong realism and wonderful fine art qualities. The paintings are beautiful even when they're inaccurate. Some of his extinct animal renderings were ahead of their time, like his lively, leaping Deinonychus. Every one of his contemporary animal and nature paintings is perfectly accurate and far more beautiful than any photograph. The book is a collection of essays and sketches, both natural sketches and skeletal and muscular diagrams. When I look at trying to analyze, say, the odd lumps and bumps in that rounded mound that is my cat crouching, his skeletal diagrams and insightful essays help me understand what's fluff and what's bone, what's loose skin and what's bunched muscle. Knight's animal drawings are lively and natural. I often study them for technique as well, looking at textures and relevant details, seeing where he simplified and where he didn't. The book is indexed and easy to navigate. Subjects include hair tracts and textures, how animals lie down depending on their species, young animals, animal expression and the expression in birds' eyes. Concise and intense, each of the essays is worth reading and rereading. Beyond that, whenever I have any problem in animal drawing, the first thing I do is check the index in Knight to see if he's got anything to say about it. Chances are he has, and the skeletal drawing, text, muscle sketching and other drawings will solve my problem. This is one of my top five art instruction books of all time. 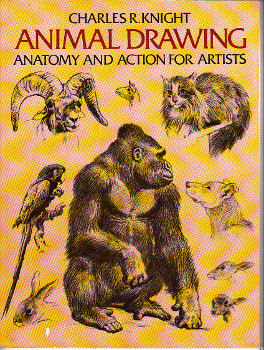 If you love painting and drawing animals, go ahead and pick up this inexpensive Dover volume. Replace as needed, because his beautiful sketches and ink drawings are a lifetime's study.